I was very pleasantly surprised last night to find an e-mail from Bob Keeton–on whose radio show, Living Successfully, I aired a segment entitled SOUL TALK for several years. He now lives in New Mexico and I had not heard from him for awhile. He sent me the URL to a video he was in the process of uploading on YouTube. 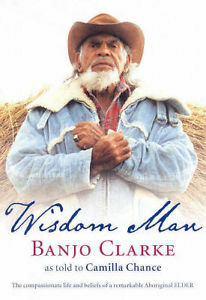 This video made my heart sing, because my dear friend continues to use his extraordinary talent for tapping into the true meanings in life and, this time, had done so by producing a video on an Australian aboriginal WISDOM MAN, Banjo Clarke. For thousands of years, aboriginals have passed down their knowledge of how to live in unity with Mother Earth. They have much to teach us as we join together to return our Mother to her pristine condition. Perfect timing = Divine Timing!